Sedona hasn't been a major player in the shrinking minivan game, but this third generation could well raise the ante. A bit bigger, roomier, and more structurally robust, with a new powertrain, the Sedona is more refined, quieter, and offers a broader range of trim levels. 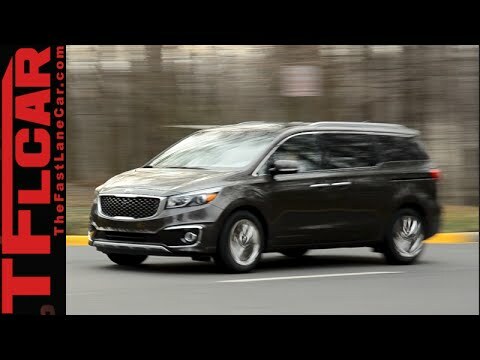 Just one caveat: The word "minivan" has been expunged from the Kia lexicon. Luxury car performance for an average car's price. I really love thus cars performance & overall reliability. It has a backup camera which helps to prevent minor accidents or bad parking, it LOOKS like a car that would cost way more (Has a luxury Look & performance), & it rides SO smoothly it just feels like your driving on flat grass no matter the type of road. It also snows where I live (BLACK ICE!!) & but this car drives so good with such fast-acting brakes that you don't even worry when the weather's bad & you need to go somewhere. EXTREMELY Spacious, it looks SO much more roomy on the inside than you would attribute it being from just looking at it from the outside & the ceiling is pretty high (so NO cruched backs from ducking awkwardly while moving around once inside. Sound system it comes with is really good quality & It also has PERFECT steering response time/ performance as well. No cringing, no worrying, no stress, & NO discomfort just super smooth & cozy sailing with this car. My vehicle is a white, 2015 Kia Sedona minivan. I feel it is very reliable. I have had no mechanical issues with the vehicle. It does not seem as big and boxy on the outside as some other minivans, and I like that it looks a little bit more like a van-SUV hybrid. It has plenty of room for 7 passengers, and it is very comfortable. I do wish, however, that the seats cloth cushions were made of better material. They stain easy and are very hard to clean. I have tried to clean them myself and had them detailed and they still have unsightly stains. I also had an arm-rest break off of one of the chairs, as well as the middle console get stuck and locked. I'm not sure why either of those things happened, but it is an annoyance. I also like that it beeps when I am too close to something behind me or someone/something is behind me when I'm backing up. It is great for a big family but does have a few issues that are not budget friendly if your warranty has run out. My 2015 Kia Sedona is a wonderful family vehicle. It is a 7 passenger stock model. Even tho it is stock to basic features are wonderful. It has a great backup cam and sound system. The middle passenger windows go down. The feature I love the most is there is heating/cooling vents throughout the entire minivan. It also has a way you can synced your van to an app and do diagnostic testing from your car. The flaw about this minivan is that the middle doors on both sides have broken a couple times each with locking closed. I am currently having that issue again. Also the back seats that are stow and go do not work anymore because the handles are cheaply made and have both broke!